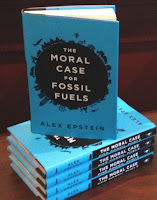 Alex Epstein's The Moral Case for Fossil Fuels is an engaging and thought provoking read, no matter which side of the issue you prefer. There have already been many thorough and positive reviews in the major mainstream media. Alex asked me to write a review, knowing my penchant for independent critical thought. It's just like Alex to do that. After reading the book, I decided to do it because the book offers a lot and therefore provides an platform for my additions. Alex has a great ability to understand and interpret the science, technology, economics, and statistics that he describes, and an equally great ability to explain it all in plain yet intellectually compelling prose. He has gathered excellent factual material to support his arguments. Merely sifting through the many clear graphs and figures is already an education. The only physics error I found was Alex's insistence that "a resource is just matter and energy transformed via human ingenuity to meet human needs ... with unlimited potential to be rendered valuable by the human mind." Actually, a resource is not just matter and energy. A resource also has entropy and every reaction in the universe increases entropy, or disorder. The entropy principle only locally appears to be violated thanks to the constant energy from the sun, thus allowing life itself for a certain limited time. The chemical energy released on burning fossil fuel cannot be recovered without recapturing it from the sun, until the sun itself burns out. Within the limit of present biology and technology, the said recapture would take a very long time compared to the time needed to burn all the planet's fossil fuels. The same is true of nuclear, where radioactive nuclides take even longer to make, on the life-times of stars and galaxies. For fusion, cold-fusion mythology aside, the expenditure needed to locally recreate conditions analogous to those inside the sun is prohibitive. And so on. For all practical purposes, this is a one-time burn. The crux of Alex's corrected point, therefore, is that humans have the possibility to live well as long as the sun is around. I would agree with that but I would say that good life is more dependent on political structure (and the dysfunctional excesses of politics) than on the human mind's ability to invent technology. I don't agree with the sentiment that there is even a scintilla of danger that the Green mythology of untouched nature could drive humanity into a cave-age era if entrepreneurs don't have the freedom to frack or extract coal (more below). Alex's documented and blistering criticisms of environmental thought leaders are well deserved and would be embarrassing for those thought leaders if they prized reason instead of smugness. After reading Alex's book, I'm starting to think of the expression "environmental thought leaders" as an oxymoron, up there with "the department of justice". Alex also provides a psychological basis for our cultural susceptibility to the Green paradigm that is anti-development. He makes a good attempt at explaining why we allow ourselves to be swayed by manipulative slogans promising attainable global bliss via harmony with nature. The book does a great job of explaining that alternative energy (wind and solar) is a fantasy at best and will not replace fossil fuel any time soon. Alex spells out the requirements for a global energy resource and the reasons that alternatives cannot meet these criteria. Alex's explanations helped me to formulate my own version, expressed as a general rule: Since some 87% or so of energy used, which powers all of machine activity, is fossil fuel (not to mention hydro and nuclear), therefore the true (no public subsidy) cost of any "alternative" is a fair proportional measure of the fossil-fuel expenditure needed to create and maintain the said "alternative". This means that "alternatives" burn more fossil fuel than the fossil fuel technologies themselves, per quantum of energy produced. "Alternatives" burn more fossil fuel than conventional energy. This will be true until the high costs in energy for total-cycle manufacturing and maintaining of alternatives is paid for using energy produced by alternatives. While the book is an excellent contribution to the public debate, Alex does not tell a sufficiently realistic story about the sociopolitical forces in play; and his evidence-based foundational premise for concluding that "using fossil fuels is a moral imperative" is incorrect. Let me start with the said premise. Alex correctly points out that there is a historical correlation between increased fossil fuel use and many global average welfare indicators, such as life expectancy and reduced liabilities from disease and natural disasters. Of course it's true that humans are able to safely inhabit more of the planet and in greater numbers because of technology that uses fossil fuel energy as the dominant energy source. That proposition cannot reasonably be disputed. Alex rigorously drives this point home (no pun intended). But Alex takes it one step too far by concluding that, since a lot of accessible and concentrated energy makes our present world and its 7-billion-person occupancy possible, then more energy use can only improve our lives, including the lives of those most in need; such that the most energy we can use is what we should do, and we should thank the entrepreneurs that make more possible. Alex pushes it to the limit and argues that more energy must imply better human lives, that the world can only be better off if more of the most accessible energy is used. Alex sees inevitable positive spinoffs from increased use of the most economically advantageous energy resources. The narrative is convincing and optimistic but incorrect. For example, a world with more war will intensely use more of the most readily available energy but it will not be a safer and more habitable world. The US is amply demonstrating this point in our era, with its destruction of Iraq, Afghanistan, Libya, Syria... and the continuous waves of nightmares it produces in Latin America. Cuba's recent "greener revolution" that occurred when it was cut off from the USSR oil supply and food imports (following the collapse of the USSR) is another example. The country had to become more self-reliant, without fossil fuel and its many benefits. It developed distributed farming, and public health increased from the additional mobility and neighbourly cooperation . All this under the US blockade. Even today, despite economic differences, energy consumption disparity (one-eighth of US per-capita energy consumption), tropical disease, the continued US blockade... the US and Cuba have virtually the same life expectancy at birth, 79.3 and 79.1, respectively (2016). Using another measure, Cuba has an infant mortality rate of 4.6 per 1000 live births per year, whereas the US rate is 5.9 (2015). But there is way more to a healthy and meaningful life than life expectancy at birth and national energy consumption. I don't agree with Alex that happiness is measured by one's amount of leisure time and the ability to use energy (travel to exotic places) in one's leisure. I don't even agree that the goal in life is to be "happy". I think a satisfying and meaningful life comes from self-knowledge, community and culture, and that Western "high energy" lifestyles tend to isolate and fragment. Meaning is tied to depth of connection, to oneself and to the community. The variables locally controlling depth of connection (and its dynamics from liberation struggle) are too numerous and disparate for an energy-use trend to be found or to have any value in social policy discussions. In other words, Alex did not convince me that on an anthropocentric standard we benefit from more accessible energy. If the goal is to help those most in need, then Western countries can dramatically achieve that at very little expense, without needing to increase global energy production . In any case, I would argue that those "most in need" are peoples whose nations have been disrupted by interventions from colonizers who had mastered accessible energy. That is certainly the case with Canada's aboriginal peoples . But this makes little difference to me because, likewise, the environmentalists have not convinced me that energy use in itself is negative or that more use will be harmful . I find both arguments (Alex vs CO2 alarmists) to be simplistic and beside the point. Whether nations will destroy all natural habitats or only most natural habitats or put aside areas for nature reclamation is a question of real (and unjust) politics, which has nothing to do with CO2. Likewise, whether a global carbon economy is imposed, and the degrees to which it is imposed, will depend on power struggles that have nothing to do with saving the planet. Domestic carbon taxes also have nothing to do with saving the planet. And the US domestic freedom of domestic companies to extract shale oil and gas will depend on domestic power struggles that are overlaid with the global agendas. The present war in Syria and its many regional and global repercussions will determine shale freedom in the US more than any marketing campaign or thought leader could ever achieve. I don't like imperialism. I don't like war. And I don't like the infantile blabbering of "climate-conscious scientists". The real world is where nation states put most of their resources: War, intelligence, and geopolitical maneuvering. Everything else is a derivative, including our entire public discourse, including the entire fabrication about CO2-driven climate catastrophe . Alex is not saying it this way, but I agree with him that more freedom is better. More players, less monopolies, more opportunity, less top-layer constraints, more democracy. As it stands, a strong US domestic energy sector would mess up US strategic energy machinations that have been the foreign policy for many decades, not to mention the privileged status of the energy mega-corporations. The US world-dominance model is centrally based on controlling foreign access to finite energy reserves, and ensuring that oil is purchased in US dollars. Meanwhile domestic US entrepreneurs go and develop fracking, thereby multiplying and distributing world energy reserves and creating domestic interference in global price fixing. Additionally, where new independent entrepreneurs emerge and are successful, new political influence emerges, which is not always welcome. But fracking freedom is on the verge of happening. The world is changing. Eurasia is forming. A multipolar world is emerging. Saudi Arabia will crack from its need for cash; and cut production for a higher oil price. US nationalism is a natural response to the shifting world. I would predict that the US domestic economy will be "made great again", in order to compete more fairly. And, hopefully, this needed renewal will produce electable US national leaders worthy of trust. Having said that, if I had to pick a strategy to liberate fracking, I would sell freedom, not human value based on material resources. And I would take on the true enemies of freedom, which both nurture and feed on the climate religion. A free-market is anti-war. I would fight for rules that protect a free market, which is also free of collusion and coercion. See: The Power of Community - How Cuba Survived Peak Oil (film), Faith Morgan (Director), The Community Solution (USA), 2006. See: David Lester, The Gruesome Acts of Capitalism, Arbiter Ring Publishing, Winnipeg, 2005. ISBN 1-894037-20-0. See: Lawyer Bruce Clark - Canada's Genocide (video), Peter Biesterfeld (Director), Ontario Civil Liberties Association, 2016. Denis G. Rancourt, The Climate Religion, Dissident Voice, September 15, 2016; and links HERE. Yesterday I read the part of the book that discusses wind and solar (Ch. 2). It didn't quench my appetite. Epstein makes intermittency a much bigger problem than it seems to me. Please see this http://clive.semmens.org.uk/Energy.html http://clive.semmens.org.uk/Energy/Intermittency.html and tell me - tell everyone, in fact - of the errors you'll find.